Last analysis expected that a second wave correction was over, but a clear channel breach and a clear five wave structure upwards on the hourly chart was required before I had confidence in the target. We did not get a clear channel breach nor a clear five wave structure upwards. 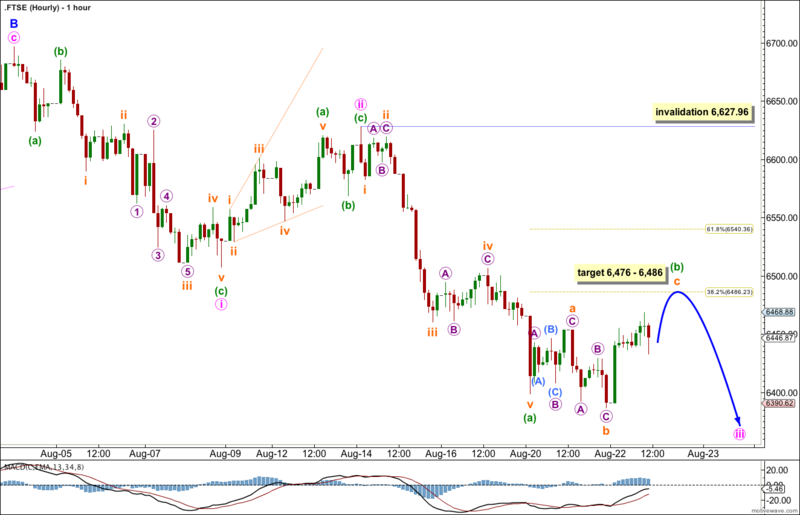 Movement below 6,708.52 invalidated the hourly wave count. 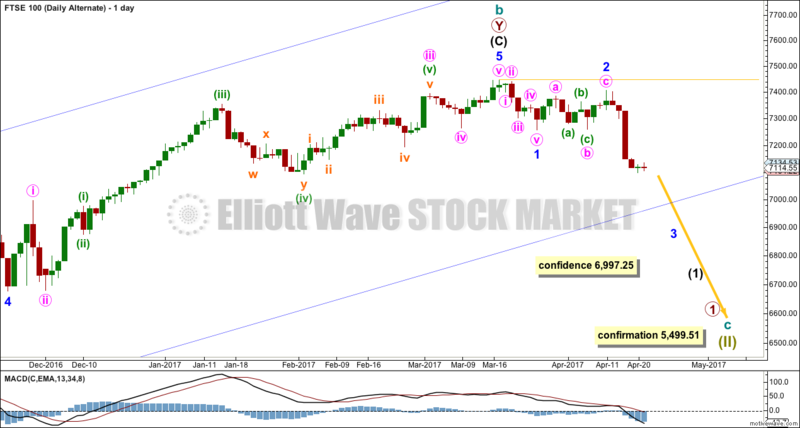 This wave count sees the FTSE in a fifth wave upwards at intermediate degree which should reach 7,103.67 minimum, and most likely above. Upwards movement for minor wave 1 of intermediate wave (5) is ambiguous. It can be seen as either a three or a five. This wave count sees it as a five. At 7,406 minor wave 3 would reach 1.618 the length of minor wave 1. This target is still now about 20 trading days or sessions away. Within the current downwards correction of minute wave ii at 6,526 minuette wave (c) would reach equality with minuette wave (a). Within minor wave 3 minute wave ii may not move beyond the start of the minute wave i. This wave count is invalidated with movement below 6,316.91. This 2 hourly chart shows the entire structure of minute wave ii. Within it minuette wave (a) unfolded as a leading expanding diagonal. All its subwaves are zigzags, as they are most commonly. Within minuette wave (c) the structure is incomplete, and I would expect more downwards movement. It looks like it may be unfolding as an impulse which would provide alternation with minuette wave (a). I have drawn a parallel channel about minute wave ii using Elliott’s technique for a correction. Draw the first trend line from the start of minuette wave (a) to the end of minuette wave (b). Place a parallel copy upon the end of minuette wave (a). 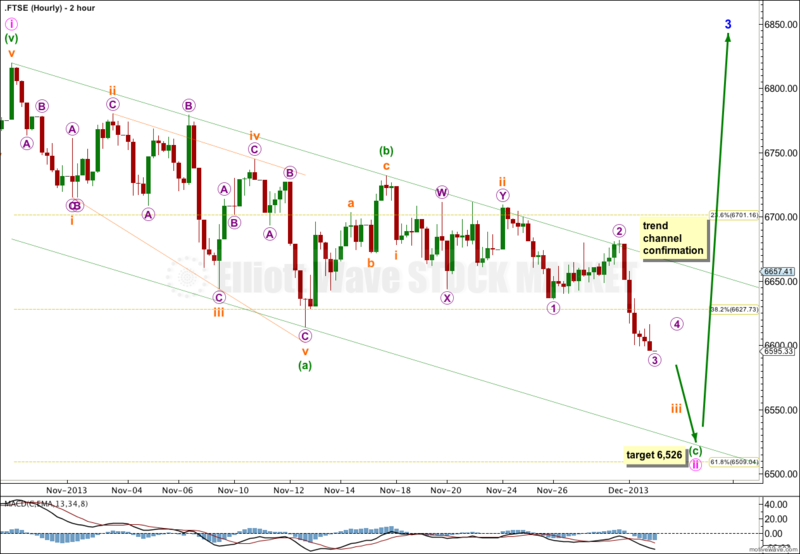 I would expect minuette wave (c) to find support at the lower end of this channel, and to be very likely to end there. When the channel is clearly breached by subsequent upwards movement then I would expect that minute wave ii is finally over, and the next wave upwards should have begun. The next wave upwards is a third wave of a third wave, and I would expect to see a strong increase in upwards momentum. Last analysis of FTSE expected a little upwards movement to a very short term target at 6,515, before downwards movement towards about 6,280.60. We did not see the small upwards movement I had expected, but overall price did move lower to reach 6,316.91, 36.31 points short of the target for the week. A very clear channel breach indicates that the correction is now over. A channel drawn about the second zigzag in the double labeled minute wave y is now very clearly breached up upwards movement. 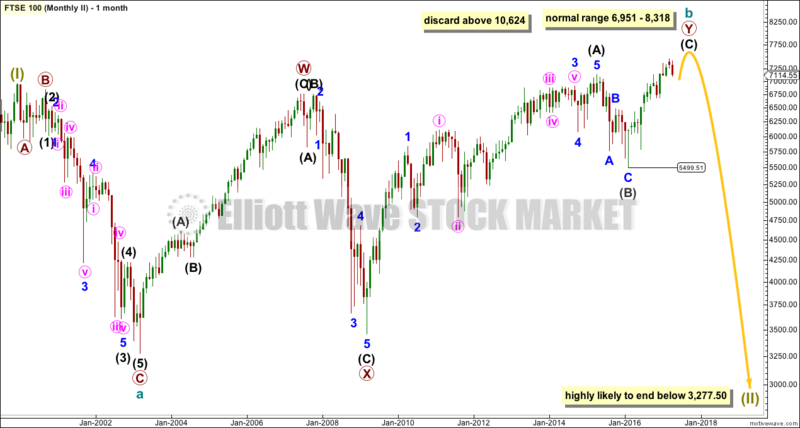 The downwards correction is likely to be over and the next wave up should be underway. 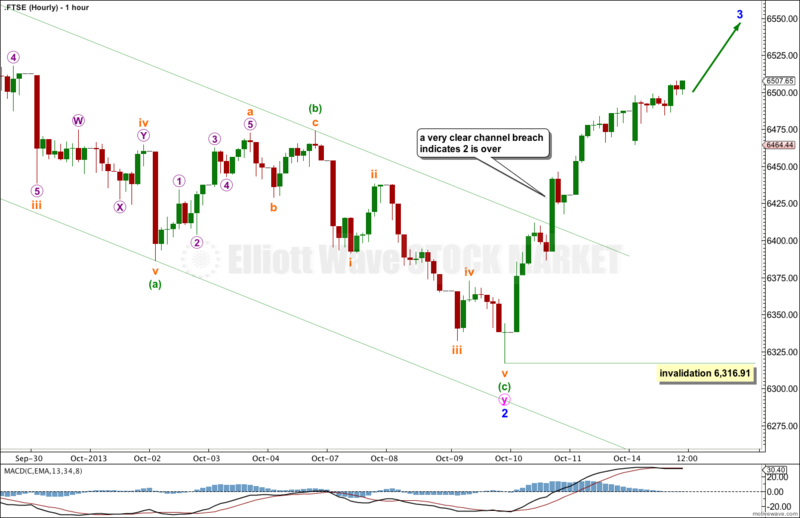 Within minor wave 3 I would expect at some stage over the next week to two a second wave correction for minute wave ii. Minute wave ii may not move beyond the start of minute wave i. This wave count is invalidated with movement below 6,316.91. 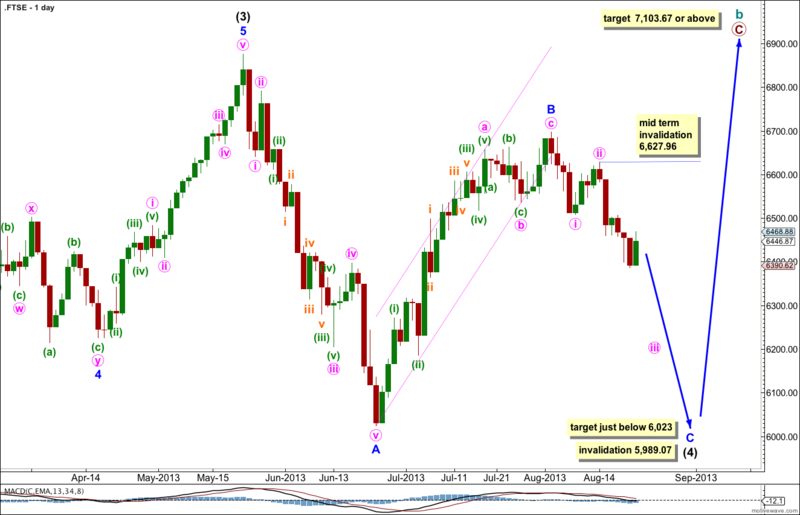 Movement below 6,386.72 invalidated last week’s FTSE analysis. This can only be a continuation of a second wave, which is likely to reach down to the 0.618 Fibonacci ratio of the first wave. Downwards movement for minor wave 2 is an incomplete double zigzag. It cannot be a flat because what would be wave B (here labeled minute wave x) is less than 90% of what would be the A wave (here labeled minute wave w). The purpose of double zigzags is to deepen a correction when the first zigzag did not move price deep enough. Minor wave 2 would be likely to end about the 0.618 Fibonacci ratio of minor wave 1 at 6,280.60. Minor wave 2 may not move beyond the start minor wave 1. This wave count is invalidated with movement below 6,023.44. Within the second zigzag of this double minuette wave (a) is complete, and a channel drawn about it is clearly breached by upwards movement. Minuette wave (b) may be an incomplete zigzag. At 6,515 subminuette wave c would reach equality with subminuette wave a.
I would expect subminuette wave c to find resistance at the upper edge of the small channel drawn about minuette wave (b). When this channel is breached by subsequent downwards movement then I would expect that minuette wave (c) may have begun. When minuette wave (b) is complete I would expect downwards movement to new lows for minuette wave (c). Minuette wave (b) may not move beyond the start of minuette wave (a). 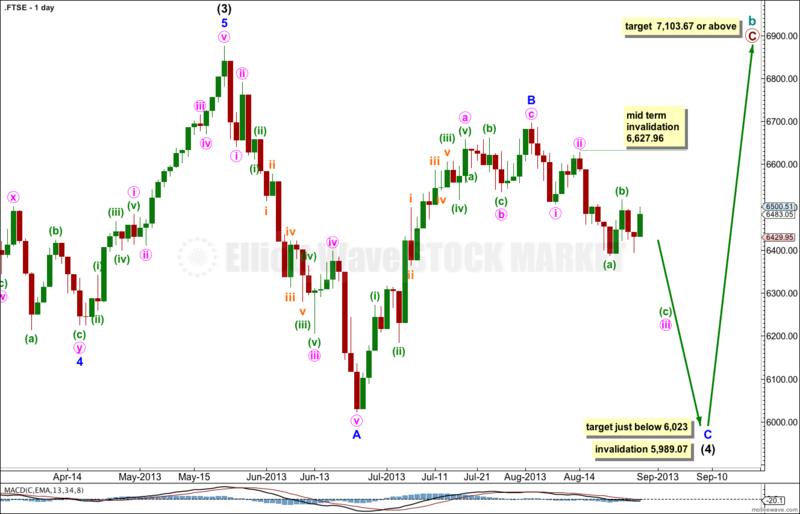 This wave count is invalidated in the short term with movement above 6,559.12. The invalidation point on the hourly chart was breached. 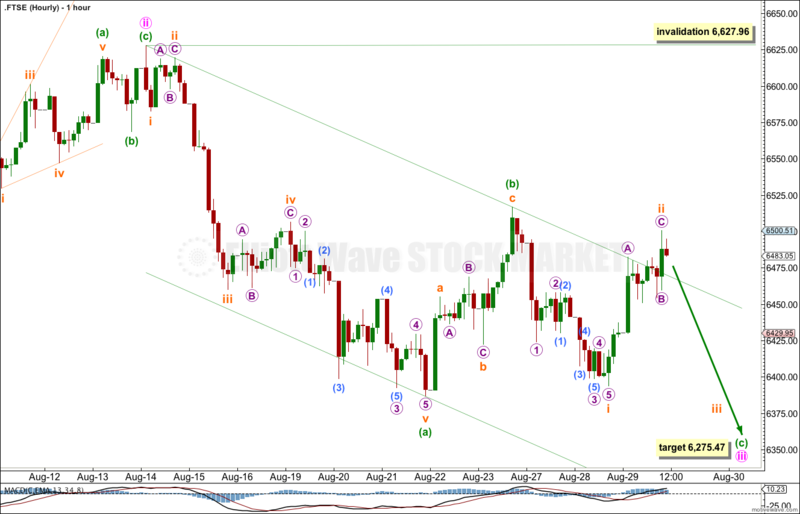 This has necessitated a thorough reanalysis of the wave count, including the monthly chart. This changes the situation significantly. 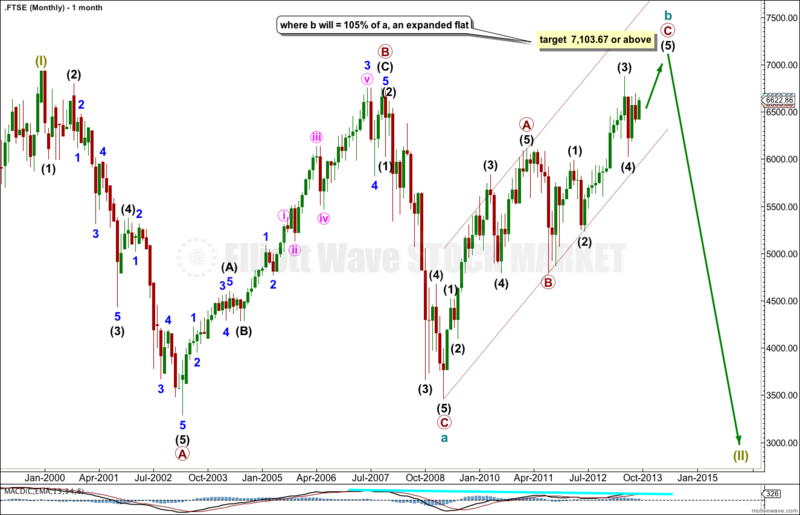 I expect now that the FTSE is in a final fifth wave upwards towards an all time high. This structure unfolding is a large supercycle flat correction. The most common type of flat is an expanded flat which requires cycle wave b to reach a minimum of 90% the length of cycle wave a. This would be achieved at 7,103.67. It is very likely price will get at least to this point, or above. Within cycle wave b primary wave C is now in the final fifth wave. Downwards movement for minor wave 2 subdivides as a zigzag. 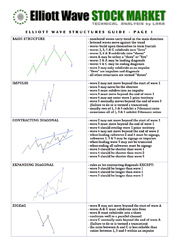 The subdivisons of that are shown in the next chart below. Within minor wave 3 no second wave correction may move beyond the start of the first wave. 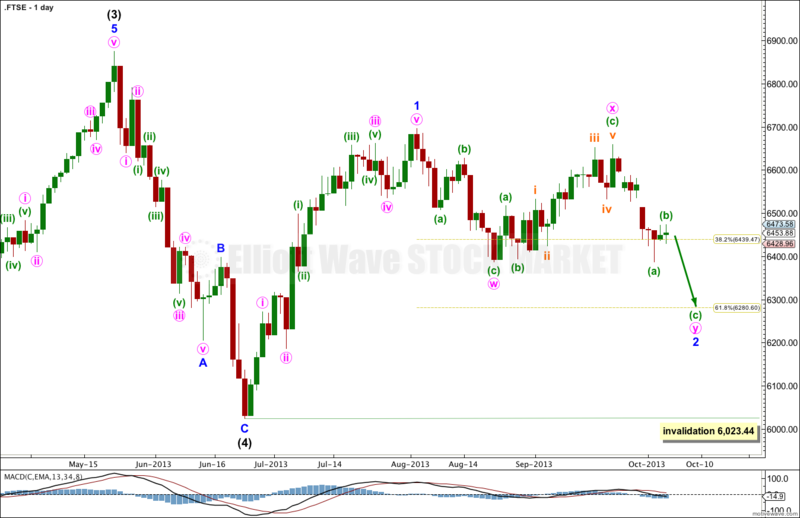 This wave count is invalidated with movement below 6,386.72. This chart shows the subdivisions of the second wave zigzag. There is no Fibonacci ratio between minute waves a and c.
Minute wave b is an expanded flat correction. Within it subminuette wave c is 3.32 points short of 2.618 the length of subminuette wave a. Ratios within minute wave a are: minuette wave (iii) has no Fibonacci ratio to minuette wave (i), and minuette wave (v) is 2.14 points short of 0.382 the length of minuette wave (i). Ratios within minute wave c are: there is no Fibonacci ratio between minuette waves (i) and (iii), and minuette wave (v) is just 2.69 short of equality with minuette wave (i). 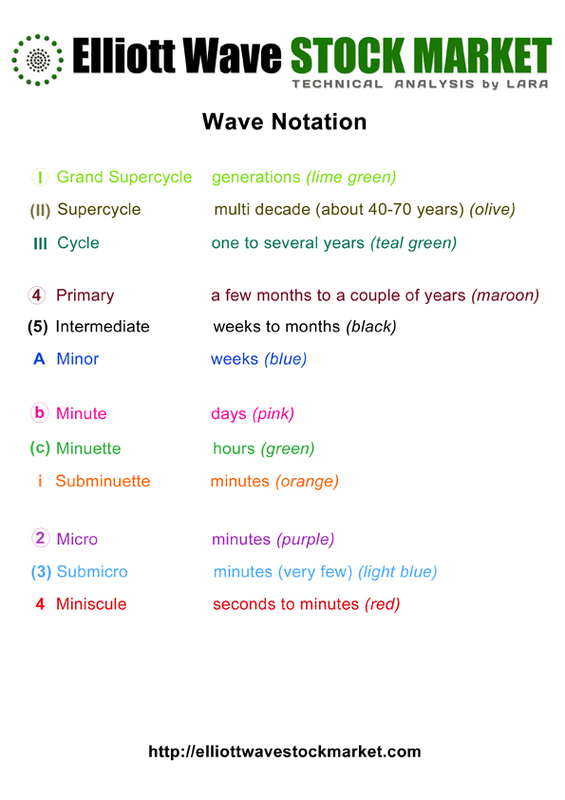 Ratios within minuette wave (iii) are: subminuette wave iii is 9.57 points longer than 0.618 the length of subminuette wave i, and subminuette wave v is 0.1 points longer than 0.382 the length of subminuette wave i. The previous problem I had with this movement was trying to see the first downwards wave as ending at the low labeled minuette wave (b) within minute wave b. It is much clearer to see a big zigzag trending downwards when this is seen as part of the following movement. So far upwards movement is very choppy and overlapping. 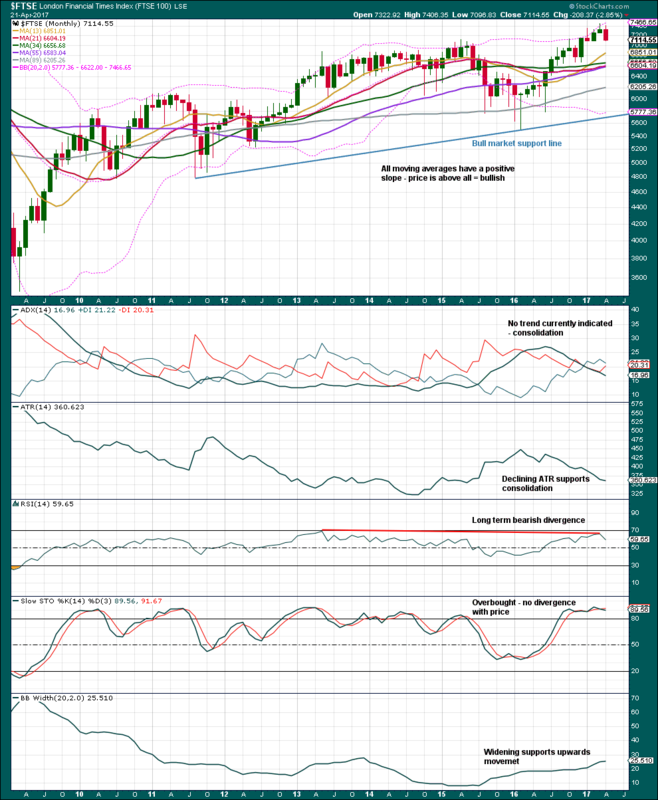 There is some increase in momentum, and a third wave may be starting to show itself. This wave count sees a series of five overlapping first and second waves so far. At 6,726 subminuette wave iii would reach 1.618 the length of subminuette wave i. If labeling of micro waves 1 and 3 are correct then we should see a strong increase in upwards momentum over the next day or so. However, there is more than one way to label these waves, particularly in the last 24 hours movement. Either way, this third wave is incomplete. When subminuette wave iii is complete subminuette wave iv should move price lower. Subminuette wave iv may not move into subminuette wave i price territory. 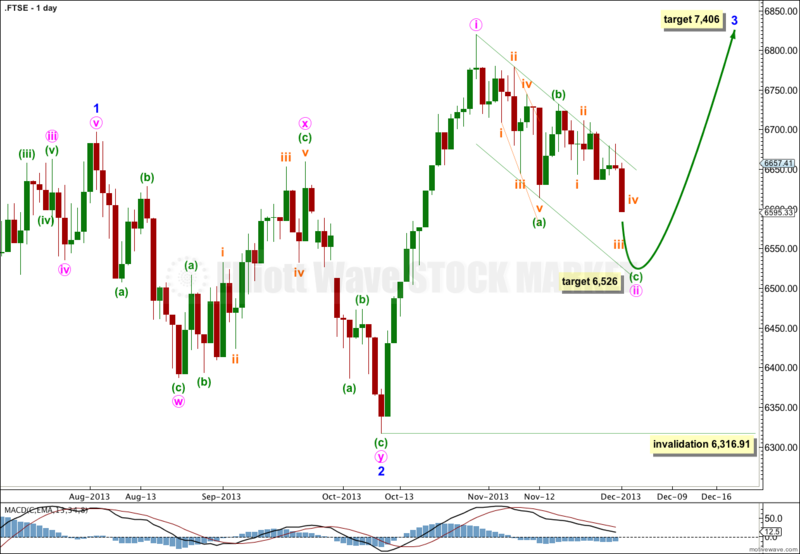 This wave count is invalidated with movement below 6,568.18. 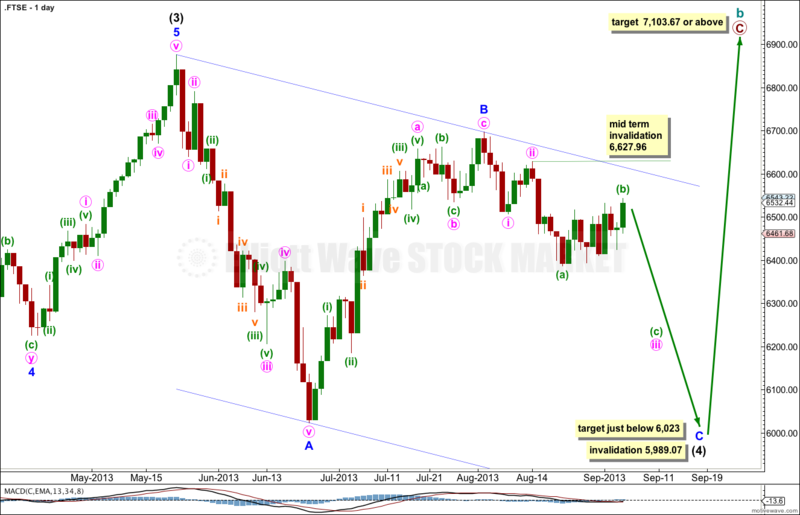 Last week’s analysis expected upwards movement to a target at 6,476 to 6,486. 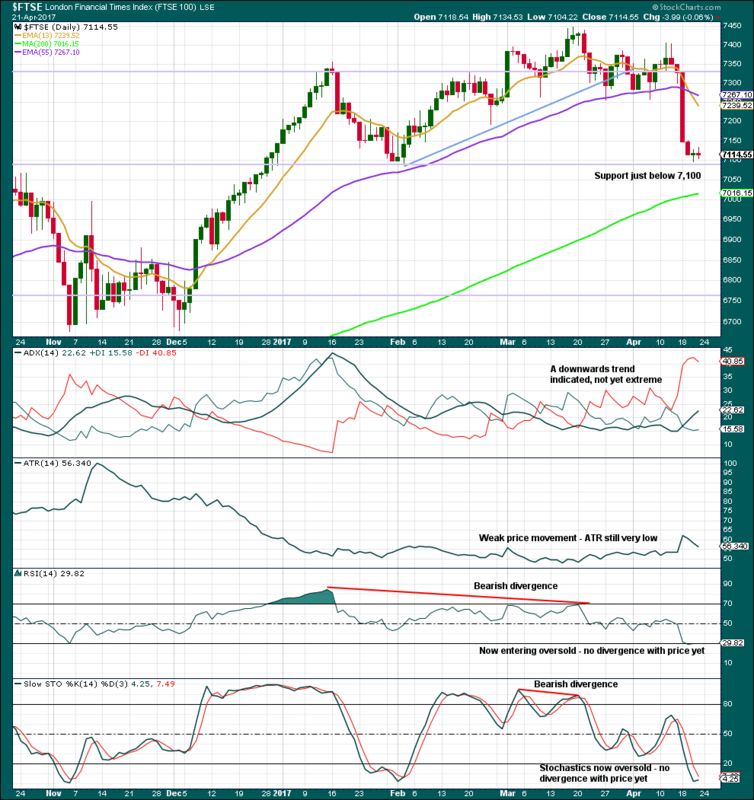 Price moved higher to 30.71 points above the target before turning lower. 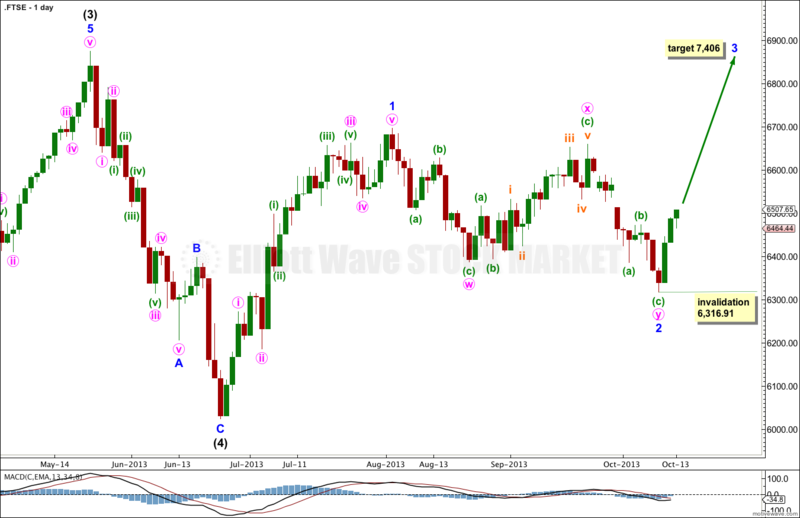 This daily chart focusses on the structure of intermediate wave (4) within primary wave C of cycle wave b. 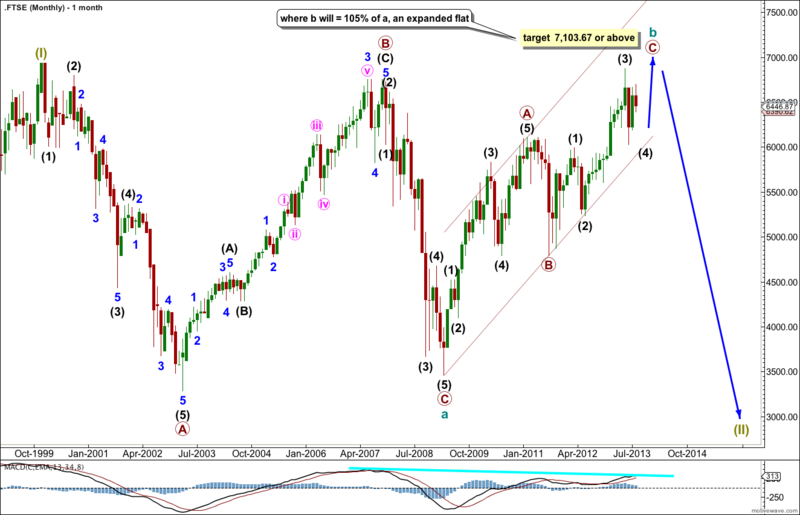 The correction for intermediate wave (4) is very unlikely to be over. I have tried to see if the downwards movement labeled minor wave A can subdivide as a three or a double three. It fits as neither. It does fit nicely as a five wave impulse, and this is likely only minor wave A of intermediate wave (4). I would expect minor wave C to end just a little below 6,023 to avoid a truncation. Minor wave C looks like it may be unfolding as an ending expanding diagonal because on the hourly chart the downwards movement for minute wave i subdivides perfectly as a three wave zigzag and cannot be seen as a five wave impulse. With minute wave i subdividing only as a zigzag minor wave C must be an ending diagonal. All the subwaves within an ending diagonal must subdivide as zigzags. Minute wave iii must subdivide as a zigzag. So far within minute wave iii minuette wave (a) is a completed. Minuette wave (b) may be a completed zigzag as labeled, or it may move further sideways and a little higher as a flat, triangle or double. Because the downwards movement labeled subminuette wave i subdivides easily as a five wave impulse the probability that minuette wave (b) is over is high. Ratios within minuette wave (a) are: subminuette wave iii has no Fibonacci ratio to subminuette wave i, and subminuette wave v is 1.07 points longer than 2.618 the length of subminuette wave i. Ratios within subminuette wave v are: micro wave 3 has no Fibonacci ratio to micro wave 1, and micro wave 5 is 1.54 points longer than 0.382 the length of micro wave 3. Within minuette wave (b) zigzag there is no adequate Fibonacci ratios between subminuette waves a and c.
Within subminuette wave b expanded flat correction, within minuette wave (b), micro wave C is 2.37 points short of 2.618 the length of micro wave A. Ratios within subminuette wave i downwards are: micro wave 3 is 1.88 points longer than 0.618 the length of micro wave 1, and micro wave 5 is 1.09 points longer than 0.382 the length of micro wave 3. Within subminuette wave ii there is no adequate Fibonacci ratio between micro waves A and C.
At 6,275.47 minuette wave (c) would reach equality with minuette wave (a). If minuette wave (b) continues then it may not move beyond the start of minuette wave (a). Movement above 6,627.96 would invalidate this wave count. Last week’s analysis of FTSE expected downwards movement for the week which is what we have seen. The wave count remains the same. 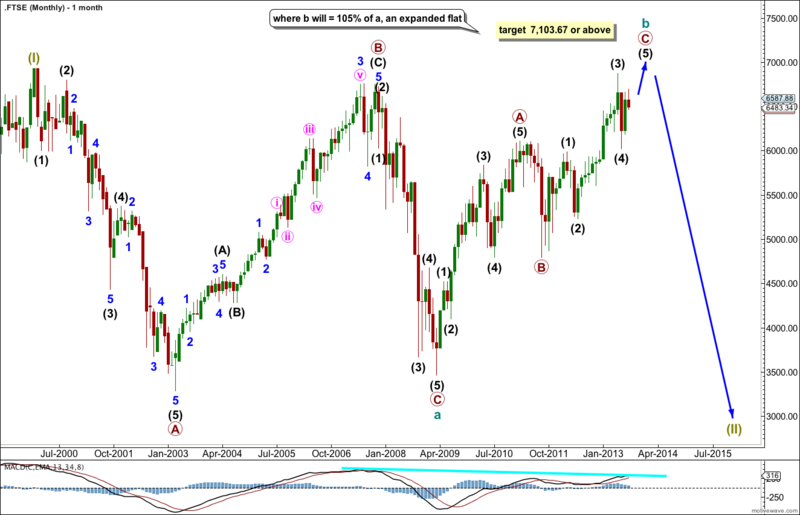 This week I will follow only the main monthly wave count. The alternate does not diverge in expectations for direction at this stage. Also this week I will begin to analyse FTSE at the hourly chart level for you. At super cycle degree this structure may be an expanded flat: cycle wave a subdivides into a three wave zigzag (with a truncated C wave), and cycle wave b subdivides into a corrective structure and has passed the minimum of 90% the length of wave a. This hourly chart focusses on minor wave C.
Minute wave i subdivides as a zigzag. 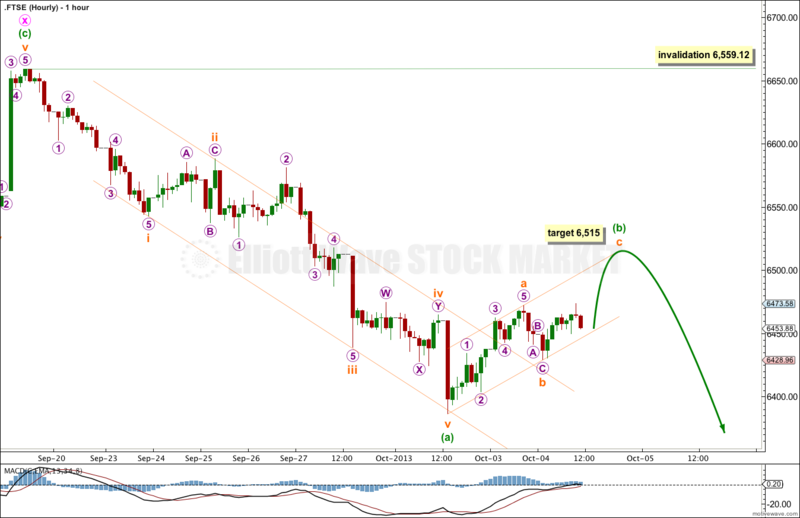 Within this zigzag minuette wave (c) is 19.05 points short of 2.618 the length of minuette wave (a). Within minuette wave (c) there are no adequate Fibonacci ratios between subminuette waves i, iii and v.
Ratios within subminuette wave iii of minuette wave (c) are: micro wave 3 is 9.33 points short of 1.618 the length of micro wave 1, and micro wave 5 has no Fibonacci ratio to either of micro waves 1 or 3. Within minute wave ii zigzag there is no Fibonacci ratio between minuette waves (a) and (c). Within an ending diagonal all the subwaves must subdivide as zigzags. This is why minute wave iii is labeled as a zigzag, and this is the only structure where you will see a third wave labeled as anything other than an impulse. Within minute wave iii minuette wave (a) is a completed five wave impulse. Ratios within minuette wave (a) are: subminuette wave iii has no Fibonacci ratio to subminuette wave i, and subminuette wave v is 9.57 points longer than 0.618 the length of subminuette wave iii. Within minute wave iii zigzag minuette wave (b) is an incomplete expanded flat correction. Subminuette waves a and b both subdivide nicely as three wave zigzags. Submineutte wave b is a 122% correction of subminuette wave a. At 6,476 subminuette wave c would reach 1.618 the length of subminuette wave a. 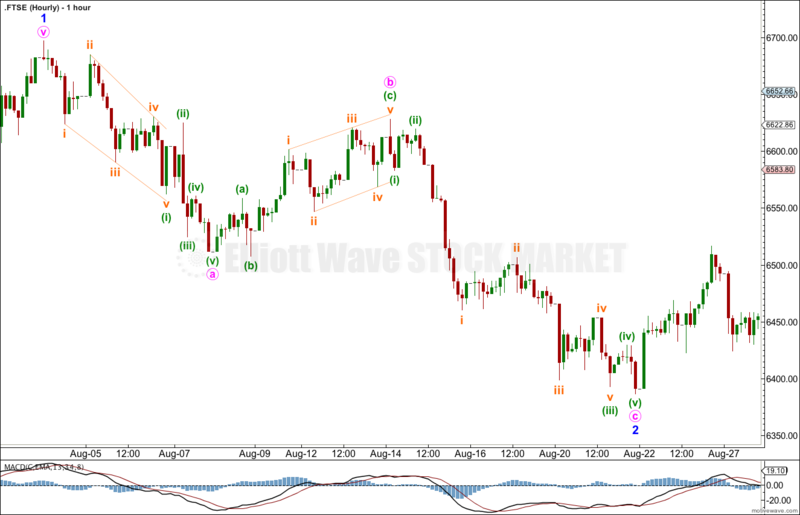 At 6,486 minuette wave (b) would reach the 0.382 Fibonacci ratio of mineutte wave (a). This gives us a 10 point target zone for a little more upwards movement. When mineutte wave (b) is complete then minuette wave (c) should unfold downwards as a five wave structure. 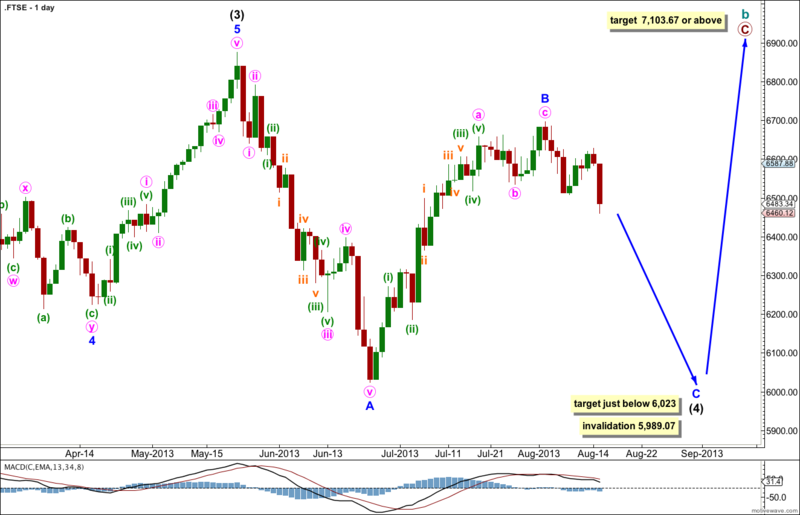 Minuette wave (c) is extremely likely to make a new low below the end of minuette wave (a) at 6,398.63 to avoid a truncation. When I know where minuette wave (b) has ended then I can calculate a target for minuette wave (c) downwards for you. Within the zigzag of minute wave iii minuette wave (b) may not move beyond the start of minuette wave (a). This wave count is invalidated with movement above 6,627.96. This is my first attempt of analysis of FTSE. I have two monthly wave counts for you. They do not differ in expectations in the short to mid term. Within each large movement I have checked subdivisions on the daily chart to see if they fit. This is the best fit that I can see. Data for FTSE begins in January, 1984. 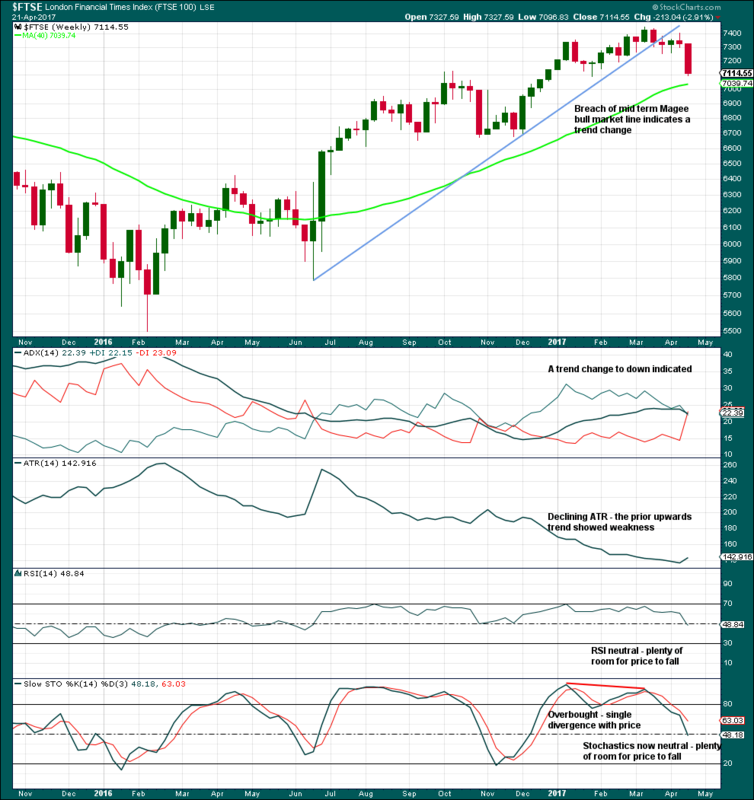 From the initaial low to the all time high labeled super cycle (I) the movement subdivides into an impulse and the movement following it looks typically corrective. The downwards wave labeled primary wave A subdivides best as a five wave impulse. Ratios within primary wave A are: intermediate wave (3) is 64.35 points short of 2.618 the length of intermediate wave (1), and intermediate wave (5) has no Fibonacci ratio to intermediate wave (1). 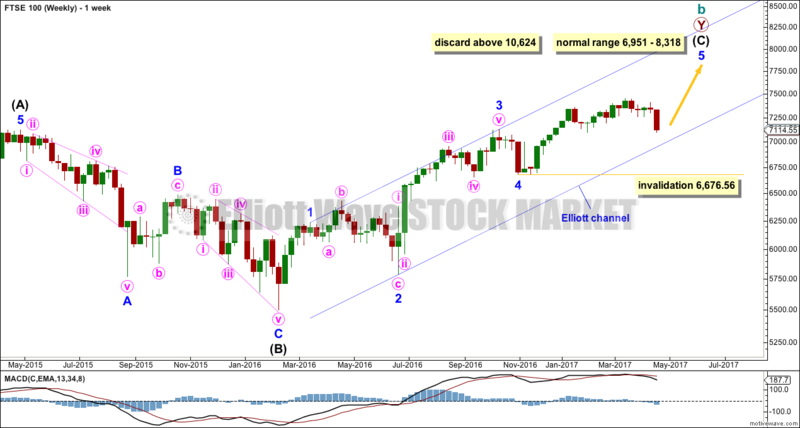 Ratios within intermediate wave (3) of primary wave A are: minor wave 4 is 61.68 points longer than 1.618 the length of minor wave 1, and minor wave 5 has no Fibonacci ratio to either of minor waves 3 or 1. Ratios within intermediate wave (5) of primary wave A are: minor wave 3 has no Fibonacci ratio to minor wave 1, and minor wave 5 is just 1.9 points short of 2.618 the length of minor wave 1. Within primary wave B there is no Fibonacci ratio between intermediate waves (A) and (C). Ratios within intermediate wave (A) are: minor wave 3 is 29.57 points longer than 0.618 the length of minor wave 1, and minor wave 5 is 24.83 points short of 0.382 the length of minor wave 1. Ratios within intermediate wave (C) are: minor wave 3 is 103.19 points longer than 2.618 the length of minor wave 1 (this is a 5.2% variation so I consider as it is less than 10% it is acceptable), and minor wave 5 has no Fibonacci ratio to minor waves 3 or 1. Ratios within minor wave 3 of intermediate wave (C) are: minute wave iii has no Fibonacci ratio to minute wave i, and minute wave v is 116.47 points short of 2.618 the length of minute wave i (a 9% variation). The downwards wave labeled primary wave C of cycle wave a I have checked carefully on the daily chart. 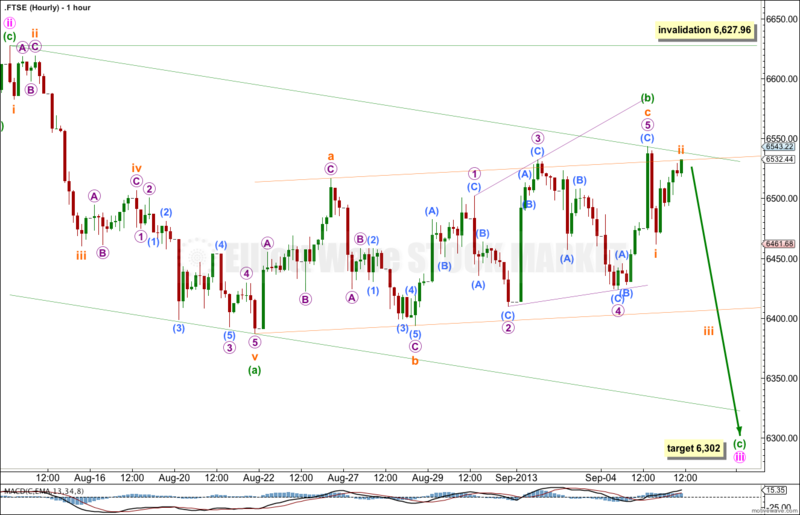 It subdivides nicely as a five wave impulse but does not subdivide well as a three wave zigzag. I have placed the intermediate degree labels here after analysis of the daily chart. 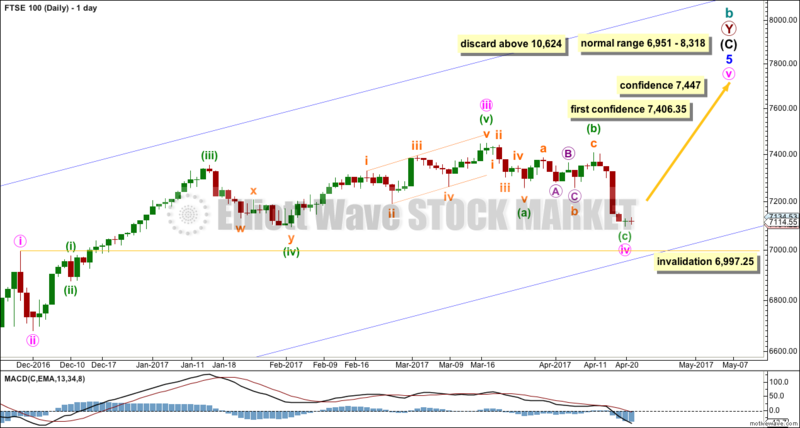 Ratios within primary wave (C) are: intermediate wave (3) has no Fibonacci ratio to intermediate wave (1), and intermediate wave (5) is 87.55 points longer than 1.618 the length of intermediate wave (1). 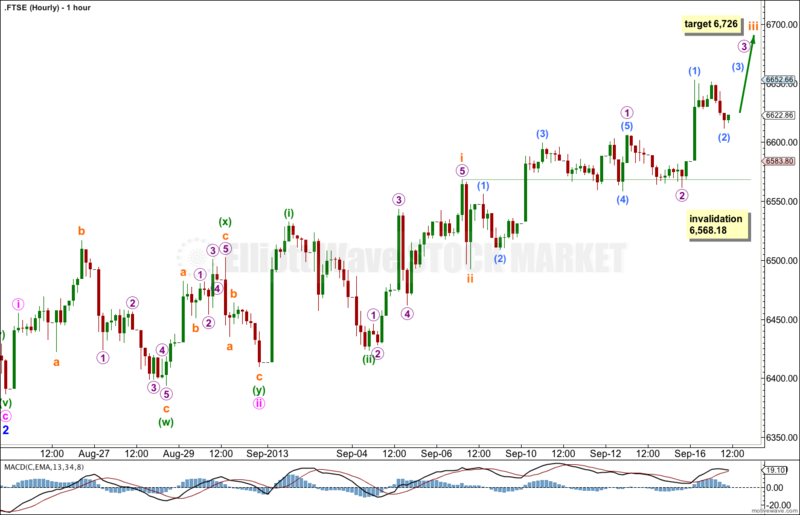 Upwards movement from 3,460.71 looks (so far) corrective and does not subdivide into a five wave structure. This looks so far like a typical B wave. Within cycle wave b ratios within primary wave A are: intermediate wave (3) is 22.39 points longer than 1.618 the length of intermediate wave (A), and intermediate wave (5) has no Fibonacci ratio to either of intermediate waves (1) or (3). Within primary wave C there is no Fibonacci ratio between intermediate waves (1) and (3). This makes it more likely that we shall see a Fibonacci ratio between intermediate wave (5) and either of (3) or (1). The subdivisions on this alternate are the same as for the main monthly wave count. Instead of a 5-3-5 zigzag for a cycle wave a this may have been the first structure in a double combination. The double may be joined by a three, a zigzag, in the opposite direction labeled cycle wave x. 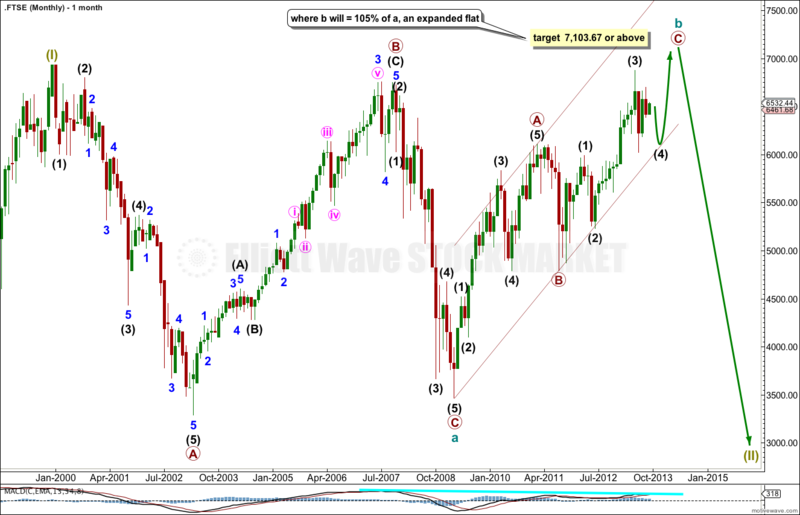 When the upwards zigzag labeled cycle wave x is complete this alternate wave count expects a second corrective structure to unfold which may be either a flat or a triangle and would be labeled cycle wave y. 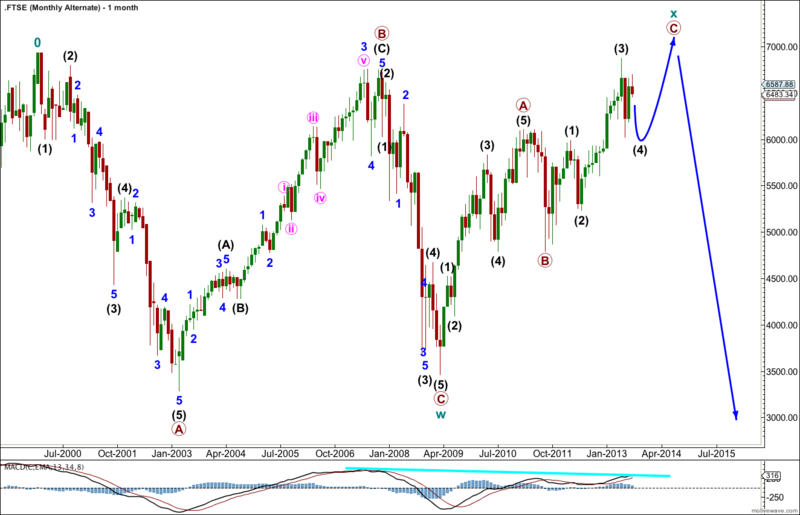 Cycle wave y should end about or just a little below the end of cycle wave a (main count).